Series 490W Hydronic Differential Pressure Manometer is the most accurate and easy to operate manometer on the market. By using wireless transducers and a versatile handheld, a single operator can monitor and balance a hydronic system in less time than traditional hydronic balancers. The Series 490W utilizes mobile technology to communicate via a Bluetooth connection with the transducers to monitor differential pressure and flow on up to three different valves. Being wireless means there are no hoses to carry, snag on equipment or needing to be drained. The 490W includes the Dwyer Hydronic Application Software that contains valve charts for numerous manufacturers. Dwyer Instruments, Inc. was recognized for excellence in product design in the 2019 AHR Expo Innovation Awards. The contest was judged by members of ASHRAE with over 20 years of professional engineering experience. 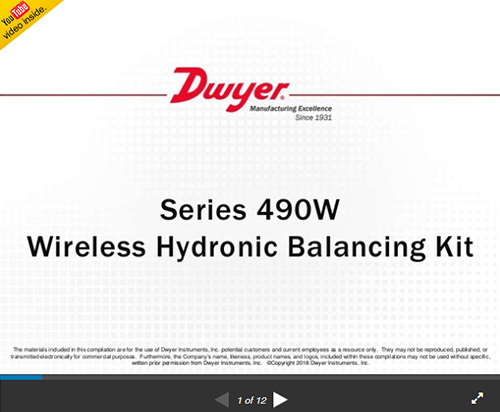 The Wireless Hydronic Balancing Kit, Series 490W, was the Award Winner in the Tools and Instruments product category. Winning companies and their products were honored during an awards ceremony held at the show on Tuesday, January 15, 2019 in Atlanta, GA. The AHR Expo is the world's largest HVACR event, attracting the most comprehensive gathering of industry professionals from around the globe each year. Since 1930, the AHR Expo has remained the industry's best place for: OEMs, engineers, contractors, facility operators, architects, educators, and other industry professionals to explore the latest trends and applications. 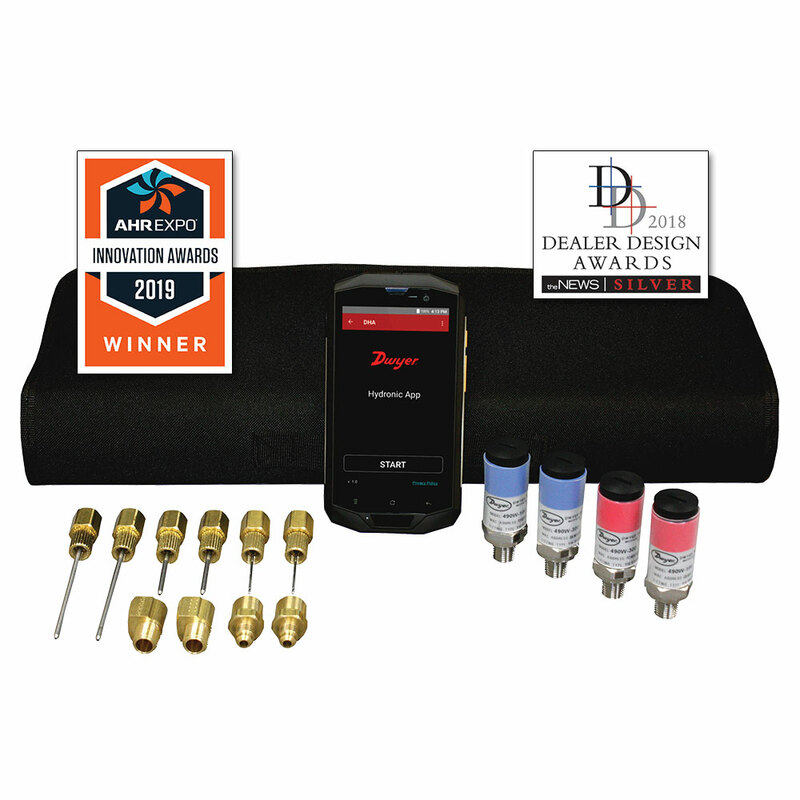 Dwyer Instruments, Inc. was recognized for excellence in product design in the 15th annual Dealer Design Awards Program sponsored by The Air Conditioning Heating & Refrigeration News magazine. An independent panel of contractors acted as judges in the contest that had 98 entries. The company’s Wireless Hydronic Balancing Kit was the Silver Award Winner in the Electronic and Hand Tools category. The ACHR News is the leading trade magazine in the heating, ventilating, air conditioning, and refrigeration industries. Up to 65' (19.8 m). 2% of reading, ±1 psi. 14 to 140°F (-10 to 60°C). -4 to 185°F (-20 to 85°C). 5" Gorrilla® glass 3, touch screen, 1280x720. CR2050 or CR2032 lithium battery, user replaceable. Rugged weatherproof handheld housing withstands 1.5 m drop test. Wireless measurement of differential pressure, single pressure and air flow. Share logged data directly from handheld over Wi-Fi, GSM or CDMA networks. Bluetooth direct wireless communication provides range up to 65' (19.8 m). The ergonomic design is much lighter and easier to work with, providing greater maneuverability and quick install setup.